Accommodation within the Castle comprises nine bedrooms sleeping 17 people (6 double rooms, 2 twin rooms, 1 single room) with eight bathrooms servicing the bedrooms. As well as the castle the estate can accommodate guests visitors in a choice of three self catering cottages. Each of these properties is full of character, unique in its style and fully furnished. All cottages are located in a courtyard setting and are in close proximity to the castle itself. Lough Cutra Castle Estate is located just three miles from the market town of Gort in South Galway, and only 1 hour form Shannon international airport. Lough Cutra Castle and its exclusive luxury accommodation is one of the finest examples of a Celtic Castle in Europe today. Perched on grounds that overlook the owner’s private lake, the 500 acre property is located in the Connemara area, Ireland, which is renowned for its pristine country side. 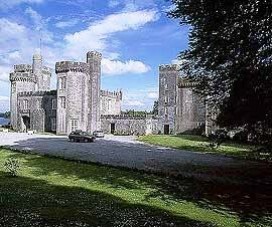 The Lough Cutra Castle’s accommodation offers its guests a choice of nine bedrooms, eight bathrooms. The estate also has some extra guest rooms available in three self catering cottages. This luxurious property can privately house 23 people within its walls and grounds offering its guests exclusive access to the Castle throughout the stay. Guests can take the Castle on a self catering basis or a chef can be arranged along with full time staff, if required, for the duration of the stay. Activities include fishing, hill walking, beaches and many other outdoor pursuits. Horse riding is the perfect way to enjoy the estate and the grounds have a good range of equestrian facilities including stabling for 10 horses. Golf, racing, hunting, shooting and sea fishing and all the best West Ireland has to offer are within easy reach. This exclusive castle and estate has a long and varied history. The surrounding country side contains evidence of a history dating back to the Tuatha Da Danaans. Explore and discover evidence of old churches, sells and Monasteries in the area. The history of the estate can be traced back as far as 866AD. Outdoor activities are plentiful on the Lough Cutra Castle Estate and include Riding, hunting, shooting, fishing, beaches, hill walking and other outdoor pursuits. The grounds feature a private lake and stables for ten horses. Golf is also plentiful and the cities of Galway and Limerick are just a short drive away. Should you choose to have a function during your stay, seating from two up to 180 people can be arranged and the castle can hold functions for large or small parties. Open fireplaces, paintings, period furniture and the general architecture of the rooms mean that any functions are held in regency splendour, yet with modern conveniences. Dancing takes place in the Main Hall, while those wanting to relax can do so in the Gough Room or by walking out onto the terrace which overlooks the estate's 1000 acre lake.